This block, Summer Winds, is based on a 6 x 6 grid, that means it can be divided into six equal parts across each row and down each column. 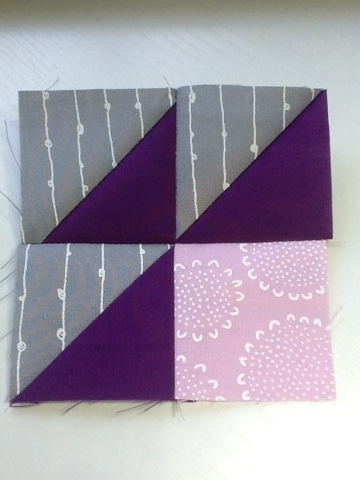 For HSTs - made with twelve 3" squares: six purple and six grey squares. 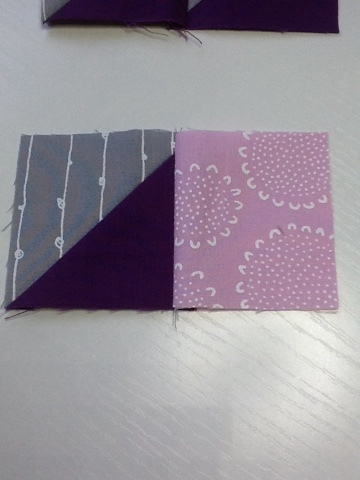 Pair each purple with one of the grey squares and make HSTs using your favourite method. 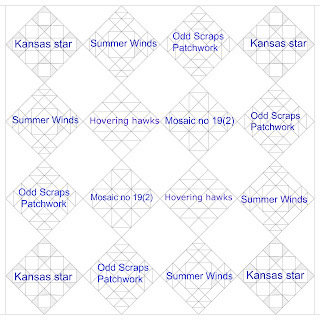 Each pair of squares will yield two HSTs. 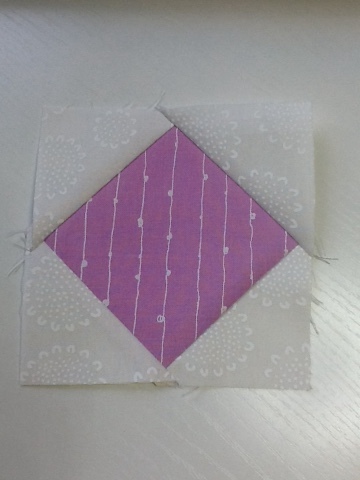 Trim each HST to 2 1/2" square. 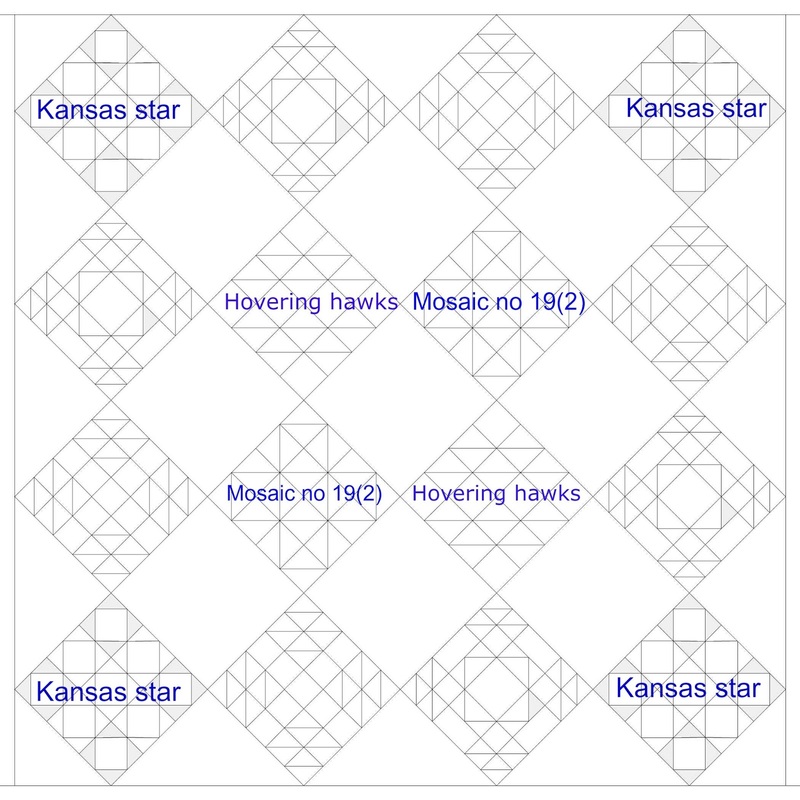 Take 8 HSTs units and pair them to make four double HST units. 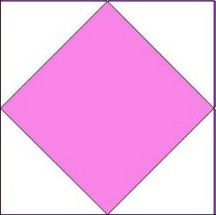 Take the remaining 4 HST units and join to the left of a 2 1/2" pink square. 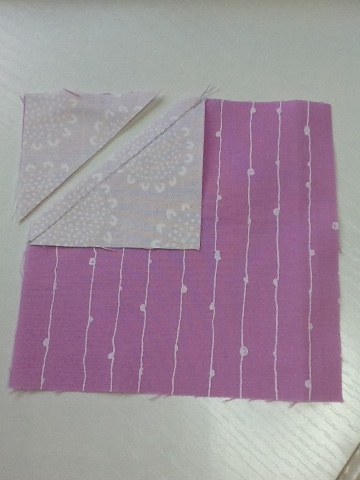 Tip : Make things easier for yourself and don't use a directional fabric! I had to make mirrored corner units because I wanted those stripes on my fabric to go the same way. Take one double HST unit and join with the HST/square unit as above. For Flying Geese Unit - four 4 1/2" x 2 1/2" rectangles in turquoise and four in grey, eight 2 1/2" white squares. 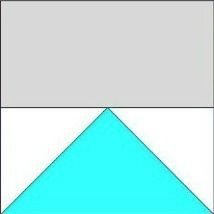 Draw a horizontal line from corner to corner on all the white squares. 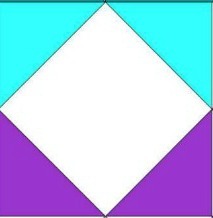 Line up one white square on the lefthand side of the turquoise rectangle as in photo, with the diagonal line starting at the top middle of the rectangle, going down to the lefthand bottom of the rectangle. 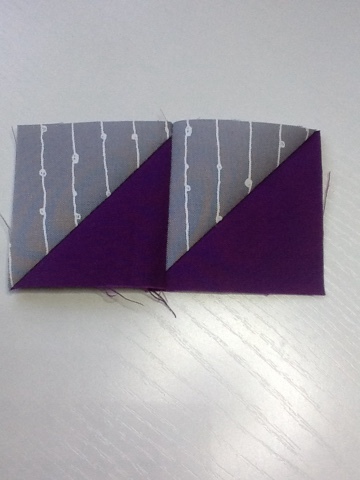 Stitch along the line and trim 1/4" from your stitching line. Press the seam open. Repeat with another white square in the other corner - see photo - with the diagonal line starting at the top middle of the rectangle, going down to the righthand bottom of the rectangle. 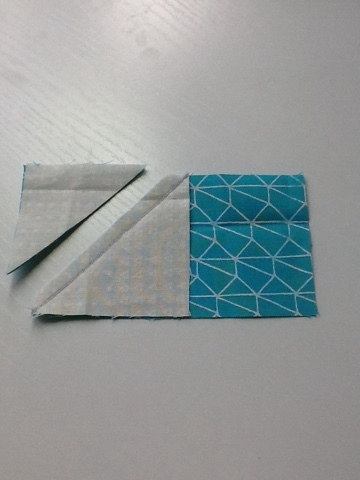 Stitch, trim and press as before. Repeat for the other three Flying Geese units. 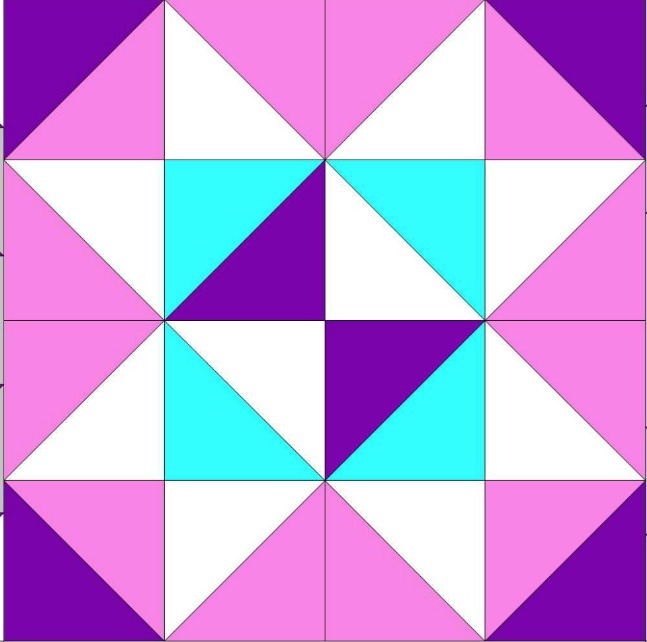 Arrange units as in block diagram below, with the purple 4 1/2" square in the middle. 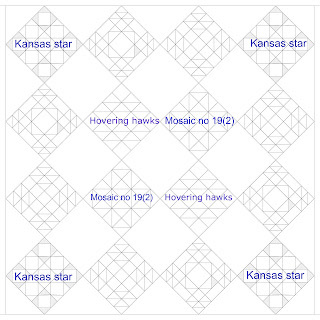 This block, Kansas Star, is based on a 3 x 3 grid - a glorified nine patch if you like. 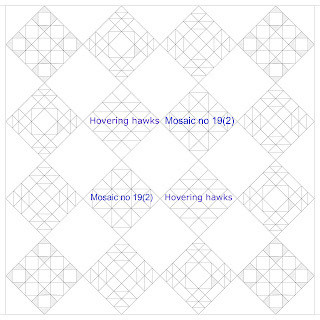 Each ninth part is made from a square in a square block, like this one - which is the centre unit. 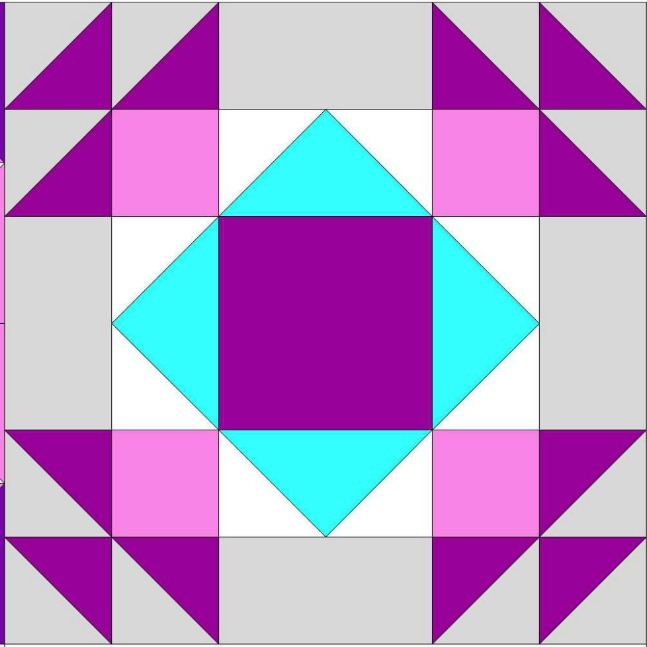 Draw a diagonal line on each of the small squares. With right sides together, line up the first white square in the top left corner. 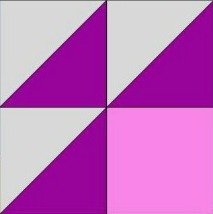 The marked line should touch the edges of the bigger square, as in the photo. 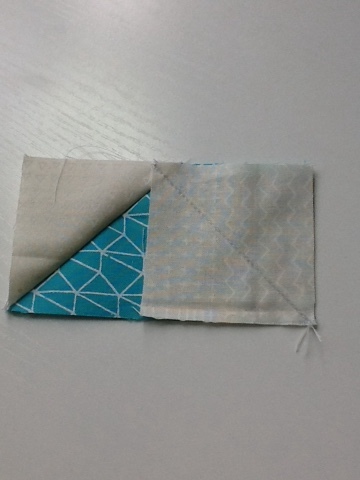 Stitch along the line and trim away leaving a 1/4 " seam allowance. Repeat in the other four corners. squares on the top and two 2 1/2" purple squares on the bottom of the bigger square. When all units are complete arrange as in the block diagram above. Press seams within the row in alternate directions - row 1 to the left, row 2 to the right or press seams open if preferred. 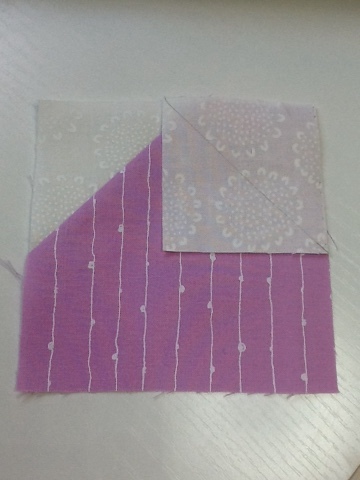 To join rows, line the seams up, pinning if necessary and stitch. When completed press. On my FAL list were several cardboard boxes I wanted to cover using my FAL tutorial here. 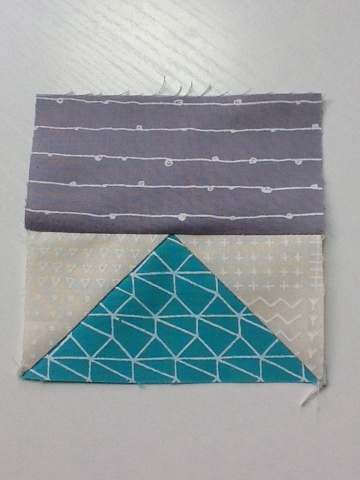 Above are the ones I made when I posted the tutorial as part of FAL Tutorial week. 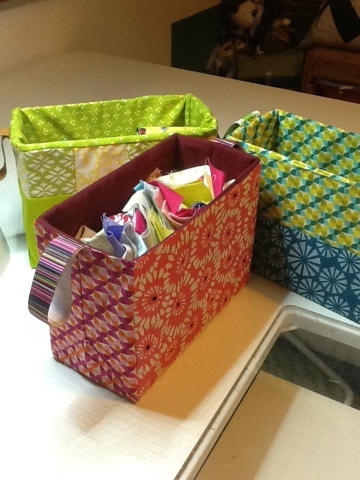 They are a fun way to use up scraps and to make a boring box much prettier. I use them to keep all sorts of scraps in - scrappy binding leftovers, strips, squares, bonus HSTs and those triangles leftover from making flying geese or square in a square blocks that I haven't converted into bonus HSTs. It is surprising just how much fits inside them. 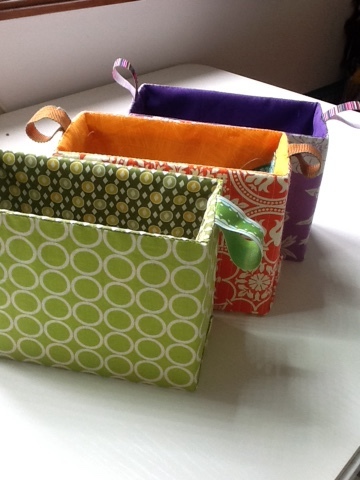 I made these slightly differently adding a contrast strip to the top of the box or the sides. 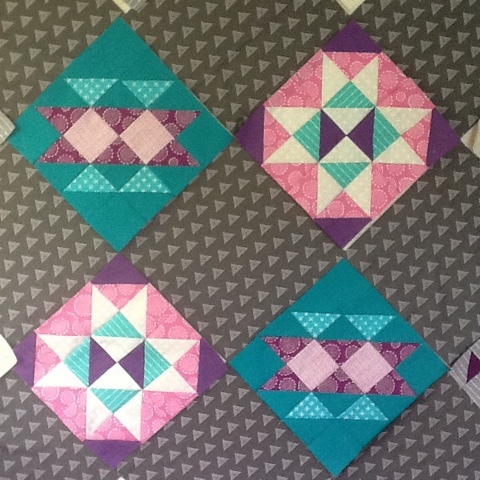 It started when I found a strip of 2 1/2" squares in yellow and green. 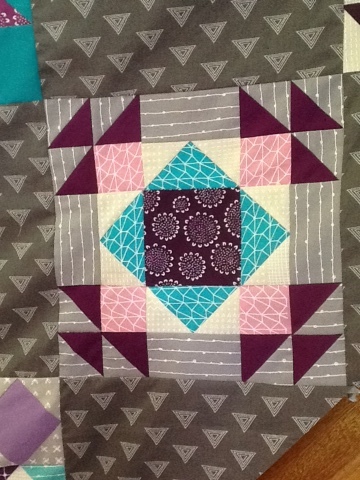 I added it to some green fabric leftover from my hoopla quilt. 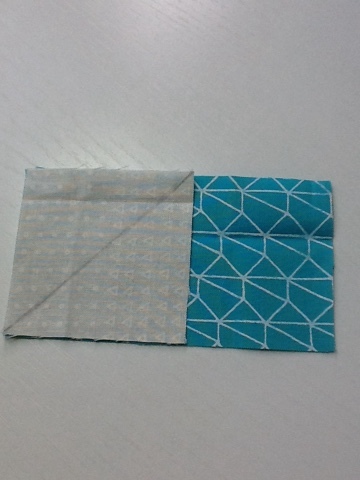 I adjusted the measurements as a result, adding in an extra 1/2" seam allowance to the constituent parts so that I still end up with my 12" X 15 1/2" rectangle. It seemed a good idea to use up scraps found inside this box to help cover it. 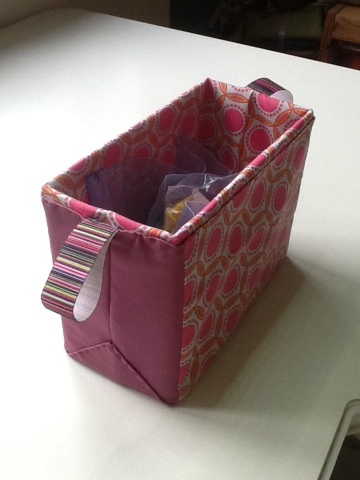 The second box I used a whole 2 1/2" strip round the top of the box and then used the same fabric inside. 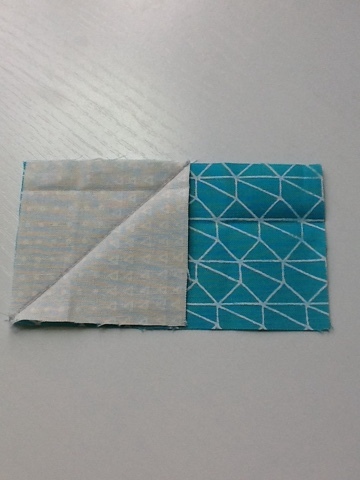 The third box has a different fabric on the short sides of the box - ok I admit is wasn't where I intended it to be but I was half watching the Olympics and not concentrating fully. It still looks good though - better than the cardboard boxes anyway! One more this morning and that is it for now - still managing to add the strip to the side rather than the top - grrrr! I finished this one by joining the outer with a running stitch in floss along the top which actually holds it together and is quite decorative. Note to self : To add a strip to the side add it to the 15 1/2" side, to add a strip to the top edge add a strip to the 12" side! I might have to do one last one to confirm this! I will add this note to update my tutorial. Better to have everything in one place. 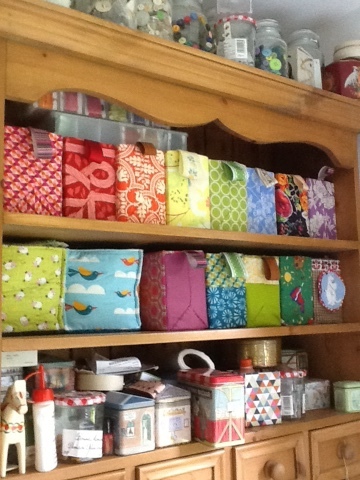 And here they are in my wall unit where I keep them - they fit snuggly on the shelves and look tidy and colourful. But they are useful as well. As they are all different I am hoping I can remember what is inside each one. If I keep forgetting I will add a small label to the ribbon handle to remind me. 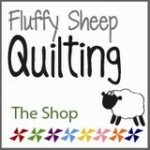 This is my nineteenth finish from my FAL list! I'll be linking it up at the end of this quarter. Here is my original list. 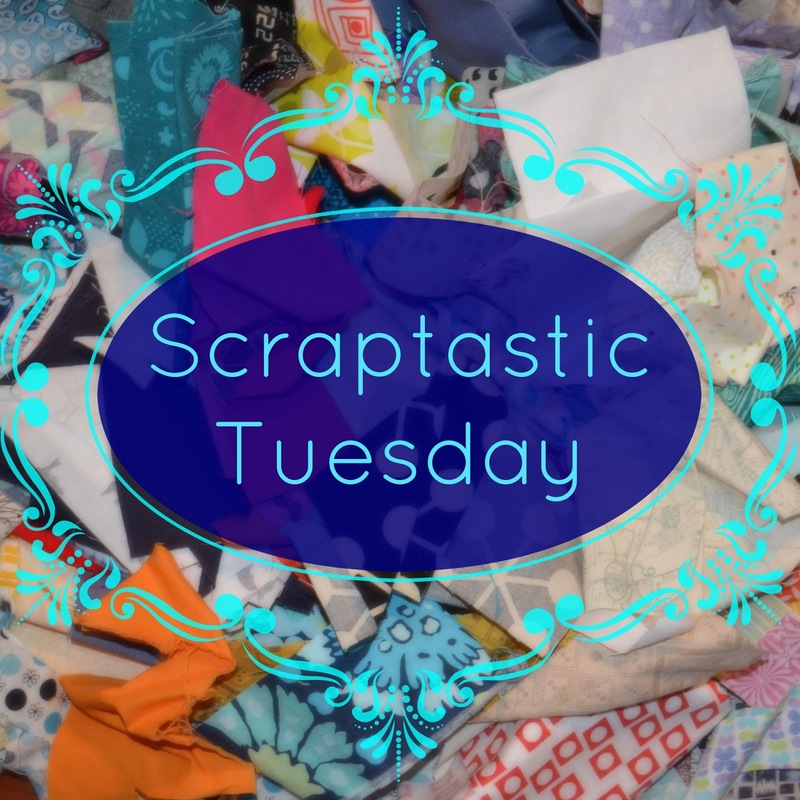 Please join Leanne from She Can Quilt and I next month to link up your scrappy project or thoughts on taming your scrap mountain on the second Tuesday - September 13. 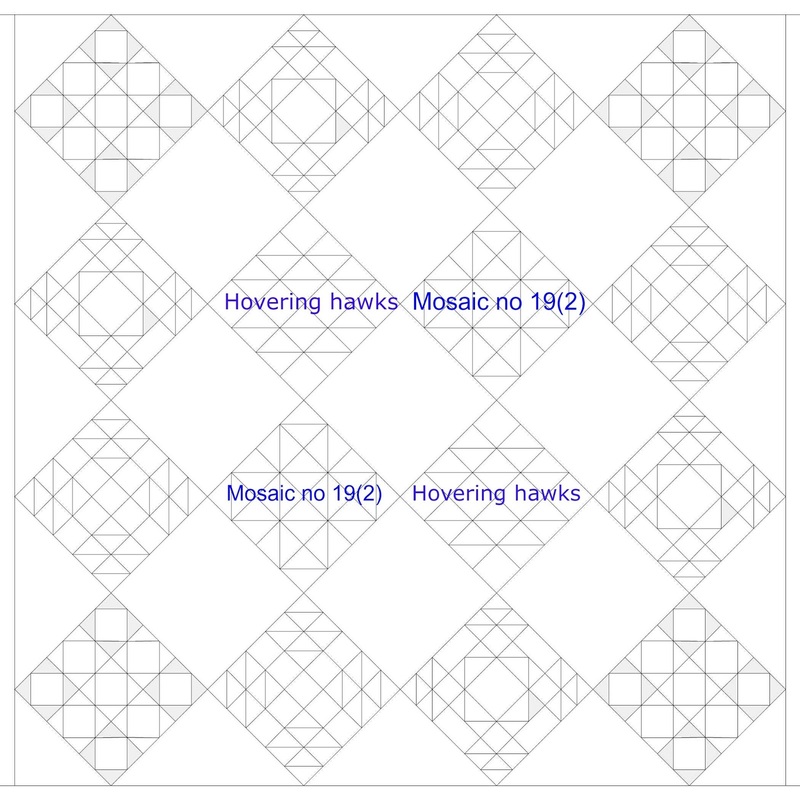 Like Block 1, this block, Mosaic No 19(2), also has a four x four grid, that means it can be divided into four equal parts across each row and down each column. 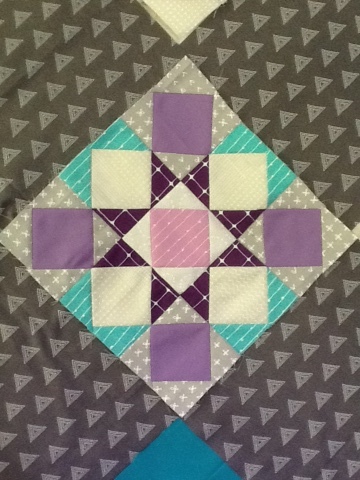 This is a 12" finished quilt block (unfinished 12 1/2") so each HST measures 3" finished (unfinished 3 1/2"). 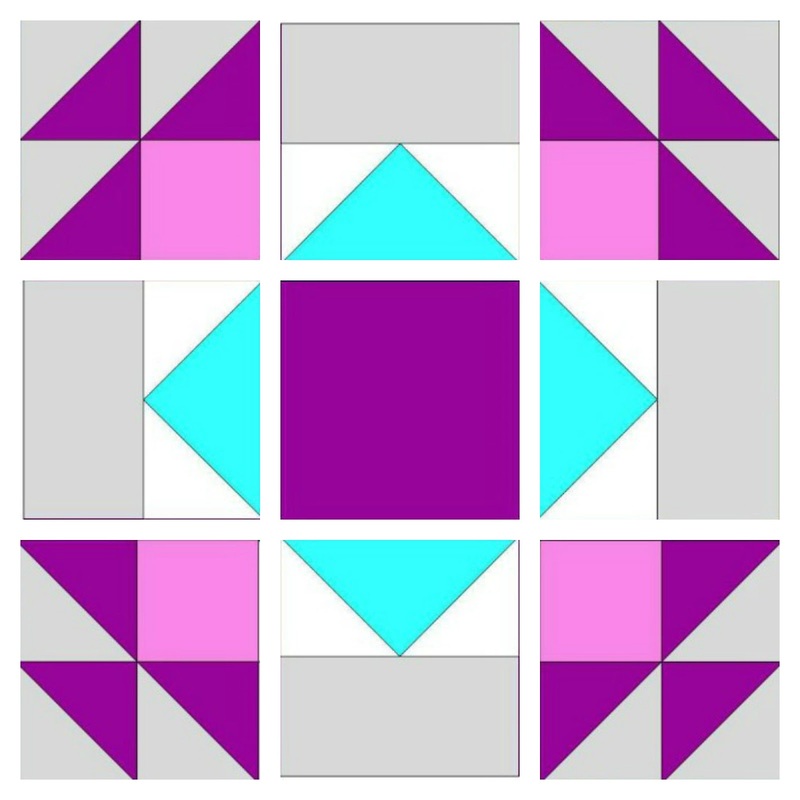 Pair 2 purple wih 2 pink squares; 1 purple with 1 turquoise square; 1 turquoise with 1 white square ; 4 pink with 4 white squares. 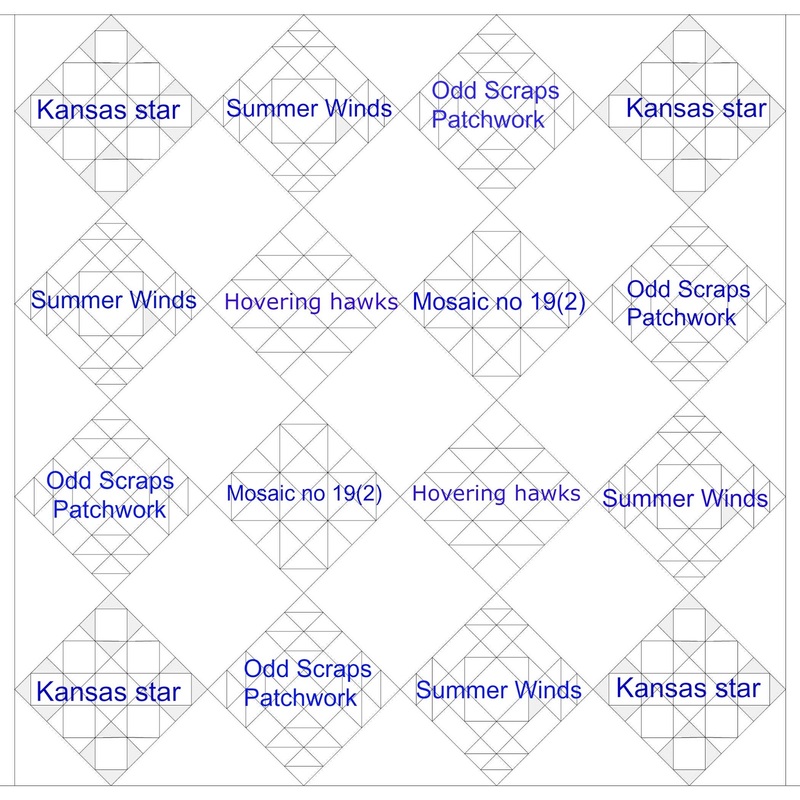 Each pair of squares will yield two HSTs. 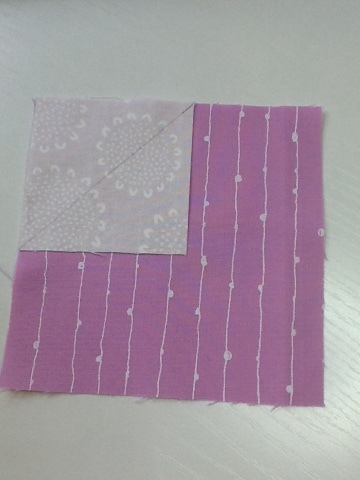 To join rows, match the seams up, pinning if necessary and stitch. When completed press. Come back later today to see who our winners in August are!